Yes, I have designer training pads from Pruven! Pawsome! What makes a training pad a designer training pad? What it looks like of course! I have some stylish piddy pads. In my house we don't call them training pads because I am trained. BOL!! We call them piddy pads, or potty pads. 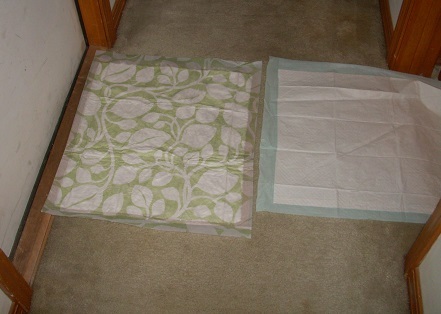 The Pruven designer pads feature a pretty green & white leaf pattern. Mom likes to put them in front of the doors. They look nice enough to be used as doormats, but they still work like regular piddy pads. If I can't get a human to open the door, I prefer to use a pad by the door instead of the one in the bathroom. Mom prefers the pretty Pruven designer pads for inside the house. They look so much nicer than regular piddy pads. Pawsonally I am more worried about scent than looks, but humans care how things look. Of course, Mom and I have different opinions about what smells good. BOL! Since the Pruven designer pads feature built-in odor neutralizer and pet attractant, both of us are happy. The designer pad even dressed up the bathroom on the train. Mom ordered the Pruven pad gripper to help the pad stay in place on the train. It comes in a large folded sheet that you can cut to the size you need. Mom cut a piece the same size as the pad. It worked, the pad stayed in place for the entire train ride. The pretty designer leaf pattern has a bonus feature. It disguises the yellow stain! I do not want to post a photo of the undisguised yellow stain. BOL!! If you use piddy pads, you know what that round yellow stain looks like. BOL!! With the green & white leaf pattern, the yellow stain is less obvious. High Paw! Mom did the 2 oz water performance test to the Pruven designer pad. The results: It had a small use area - outlined in blue; the filling puffed slightly as it absorbed; after a few minutes, it felt dry to the touch; and the wet filling shifted slightly when the pad was lifted. Pruven pads feature Floor-Shield technology from 3M. 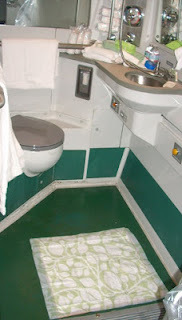 The leak-proof liner kept the floor underneath clean and dry. Pruven Designer Prints Training Pads are made in the USA! 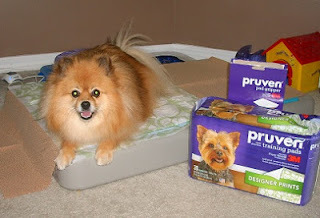 Pruven Piddy Pads are Pepper Approved. Afraid this is a product we've never used ... Maybe in a NY highrise? When would you use these? Mom also keeps a pad by the door for "just in case I can't wait" times. I guess I need to tell you the "French Fry" story to explain. BOL!! I was still a puppy when we visited Mom's grandparents. They fed me a french fry, which gave me diarrhea. Mom had put a clean pad by the door. Her Grandma didn't like the idea of a potty pad in the house, not even a clean one. She put it outside. I needed to go and no one opened the door fast enough. I pooped on the rug in front of the door. It was the closest thing to outside or a pad that I could get to in time. IF her Grandma had left the pad in front of the door, I would have used the pad instead of the rug. 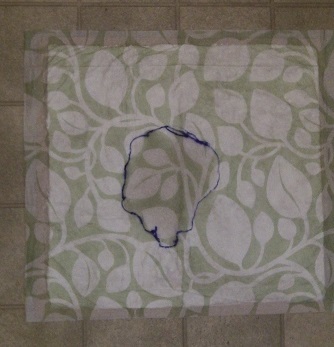 It is a lot easier to toss a pad than to clean puppy diarrhea out of a rug. BOL!! Thank you Oz! BOL!! I have always used pads since I was a puppy. I must admit that grass is my favorite place to go, but I am not picky. Please see my reply to Gizmo above for a funny puppy story. BOL!! I also line my front carrier pouch with a pad for when my anals express. 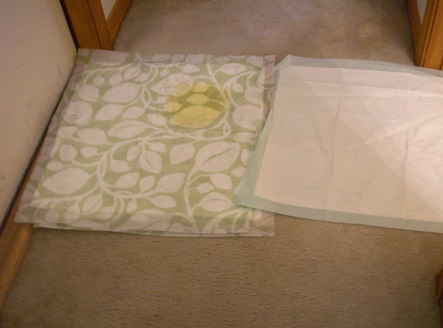 It is easier to change a pad than it is to get the stink washed out of the carrier bottom. BOL! I guess I use pads a lot! BOL! Pepper what a great blog but we use the pads that are machine washable. They look great! Way better then the plain pads. Us doggies don't use pads anymore ,but as we age we just might need them. Great review Pepper! Thank you Walker! Pads are great for senior dogs too. Yes, super! We travel a lot (LP's family and LP) ... and they would like nice at someone elses house 'just in case'... :)) Great idea...thanks for presenting to us this information! High Paw LP! They are pawfect for a traveling dog! Wow! That's a lot of P's!!!!! BOL!!!! High Paw! Those are the purtiest piddy pads I have ever seen!!! I love em! Ma's Airedale before Me use to be VERY MESSY with her water (when she would take a drink, only a small amount got into her mouth!! hehehe) most of the water would end up all over the floor, So Ma used the Piddy pads under the bowl...it was a great use for them and it worked great! Nobody slips in the puddles! Yes! They make excellent bowl mats. High Paw Ruby! I wonder if I could use them to train June Buggie? BOL!!!! Rumpy! If you pad train June Buggie, I want to see a photo! BOL!! This is much prettier than the clinical looking blue ones we've used when flying or taking the ferry. I like that it becomes dry to the touch too. I've not seen them in any local Florida shops. Where are they sold? I'll have to check these out! The designer ones are very new, so they may not be on store shelves yet. They should be at places like Target, WalMart, Amazon.com, and drugstore.com sometime this year. Many of the products I saw at Global Pet Expo are just now being released to store suppliers. Once they are in the supply chain, it shouldn't take very long to reach stores. I think Amazon.com may be one of the faster stores to get them. They have had some other products before the manufacturer's own webstore did. This is great content.I like this one. You certainly have a way with words!